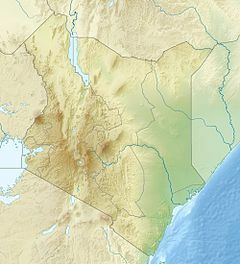 Enkapune Ya Muto, also known as Twilight Cave, is a Late Stone Age site on the Mau Escarpment of Kenya. Beads made of perforated ostrich egg shells found at the site have been dated to 40,000 years ago. The beads found at the site represent the early human use of personal ornaments. ^ "Enkapune Ya Muto Rockshelter - Enkapune Ya Muto". Archaeology.about.com. Retrieved 7 March 2017. ^ Marean, Curtis W. (1992). "Hunter to herder: large mammal remains from the hunter-gatherer occupation at Enkapune Ya Muto rock-shelter, Central Rift, Kenya". The African Archaeological Review. 10: 65–127. doi:10.1007/BF01117697. ^ Ambrose, S (1997). "Chronology of the Later Stone Age and Food Production in East Africa". Journal of Archaeological Science. 25 (4): 377–392. doi:10.1006/jasc.1997.0277. Archived from the original on 2 February 2013.